#76ers | Bring Your "A" Game Sports Talk! Raymond Brother, Fultz’s agent, announced on Dec. 4 that the 2017 first-overall pick was diagnosed with the nerve condition, which affected the guard’s right shoulder. Brothers said it was the reason for Fultz’s shooting woes. At that time, Fultz was expected to be sidelined at least three to six weeks. Six weeks would be Jan. 15. Including the 19 games he has missed, Fultz will be sidelined at least 25 games if he is out the full six weeks. He hasn’t played since Nov. 19. In Game 1 of their series, the Philadelphia 76ers — without Joel Embiid — blew the doors off the Miami Heat, winning by 27. It’s the kind of game that can lead a young team to overconfidence. That’s when Draymond Green texted Joel Embiid some words of advice, reports Jessica Camerato of NBC Sports Philadelphia. Green was right, but it’s one of the harder things for young players to understand, how much the ground can shift game-to-game in the playoffs. For the first four games especially, matchups and strategies will change night-to-night, and around Game 5 that tends to settle down and become more about execution (and talent). For the Sixers, everything in their series changed with the return of Joel Embiid. 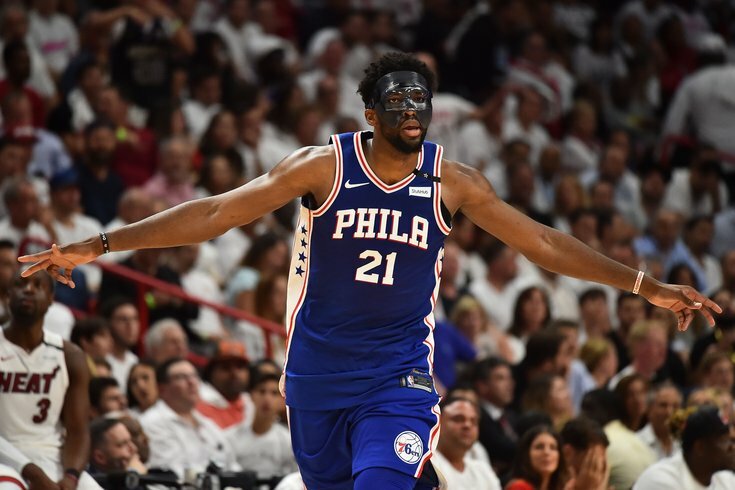 Unhappily wearing a mask, Embiid’s defensive presence in the paint slows the Heat attack and allows things like Philly’s Game 4 comeback win on the road. Now Embiid’s about to make his home playoff debut in Game 5 Tuesday night, with a chance to close out the series. Beyond the first round, in an East where the expected best teams — Toronto and Cleveland — have looked vulnerable, the door is open. “A lot of people say that we have a bright future, but I think our time is now,” Embiid said. “We have a pretty good chance. We have a special team, a lot of great guys. I don’t think we need anybody else. We’ve just got to work with what we have, and we have a special team. I feel like we have a pretty good chance to go far. MIAMI — All-Star center Joel Embiid is doubtful for Game 3 of the 76ers first-round series against the Heat on Thursday. “What I can say is there is a very unified effort with his representation and the people around him,” coach Brett Brown said about the handling of Joel Embiid’s broken orbital bone and concussion. The series is tied 1-1, and Embiid has missed both games.